Wynton Marsalis, the distinguished New Orleans-born trumpeter and artistic director of Jazz at Lincoln Center, was master of ceremonies in Confederation Park last night (June 29) for his dedicated championing of traditional jazz. Though he spoke softly in his intro, Marsalis did not allow anyone to mishear the names of his musicians. Each of his 14 players showed their chops over a full program of compositions by Thelonious Monk, Billy Strayhorn and Chick Corea, and with each performance, their bandleader touted their accomplishment. The son and brother of accomplished jazz musicians, Wynton Marsalis began playing trumpet at the age of four. He went on to play with Art Blakey's Jazz Messengers and led a movement of young jazz revivalists in the '80s called the Young Lions. In 1997, his epic album Blood on the Fields was the first jazz recording to win the Pulitzer Prize. Despite the fact most of his musicians stood up for their solos, Marsalis was content to remain in the rear. His own playing was fierce, as was the audience's response to his howling horn, but he only left his seat once: to stand and invite members of the Moscow Jazz Orchestra to join them on stage for Horace Silver's "Señor Blues." Six Russian musicians, including bandleader Igor Butman on tenor sax, joined in and confirmed what Marsalis called "our brotherhood, our sisterhood, all around the world." The MJO, set to play at the Ottawa Jazz Fest on June 30, were casually dressed, and their jeans contrasted the smart suits and ties that all Jazz at Lincoln Center musicians wore. The sole member of the Orchestra without a jacket was percussionist Ali Jackson, who took over MC responsibilities for an encore that featured Duke Ellington's "Big Fat Alice's Blues." The piece held up the sax section with Sherman Irby on alto sax at the forefront. 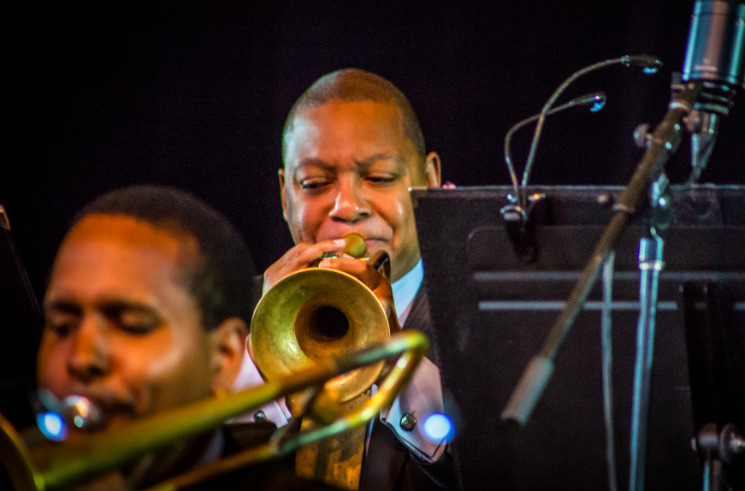 Though he did not play, Marsalis sat back and hooted quietly with an appreciative grimace that only the blues can inspire.